At Progressive Chiropractic we treat new patients for neck pain every week. Neck pain can be a sign of serious spinal dysfunction and can be just the beginning of a lifetime of pain and poor health. Our Progressive System of Care has proven to be successful in treating the vast majority of cases whether they be from whiplash, poor ergonomics, sports injuries or just a failure to get regular Chiropractic adjustments. Neck pain, as with all irritation to the nervous system, can produce a variety of sensations from throbbing, aching, shocking or tingling. Patients also report a “grinding or crunching” sound with movement. The pain may be localized to a particular spot on the neck or it may radiate up to the head or down the back, shoulders or even to the hands. 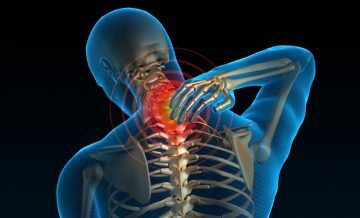 In most cases, due to inflammation of the joints of the cervical (neck) spine, there will be limited range of motion. Patients may complain of difficulty turning and lifting their head or looking down. Sleep is commonly disturbed with increased stiffness in the morning. Without proper care the symptoms usually persist and worsen, many times leading to cervicogenic (caused by the neck) headaches. The cervical spine has a tremendously difficult job as it must support the weight of the head (average 10 pounds), allow an incredible amount of motion and protect the delicate spinal cord and nerves. I often describe it as balancing a bowling ball on a ruler and the further you lean forward the heavier the ball gets. When the seven individual spinal vertebrae are properly aligned and moving properly the neck can handle many intense strains. When there is misalignment and dysfunction even small movements can cause damage to ligaments, discs and tendons leading to pain from irritation to the nerves. In Chiropractic this is referred to as “Subluxation”. Subluxations can exist for many years and even decades before symptoms become obvious enough for a person to seek care. As the mechanical dysfunction persists there is a breakdown or degeneration of the joints, ligaments and discs with increasing loss of normal alignment. This is known as “Subluxation Degeneration”. Eventually there is a situation that puts physical demand on these dysfunctional segments, such as a car accident, improper heavy lifting, a fall or even sleeping in a bad position causing new damage and inflammation. Without proper care Subluxations will eventually lead to arthritis and herniated, bulging discs. Treatment begins with a thorough examination including Palpation, Orthopedic and Neurological testing and X-rays to find the cause of the pain. When a proper diagnosis has been achieved a personalized treatment plan is determined to relieve pain, inflammation, restore motion, and when possible, realign the spine. The Progressive System starts with physical therapy modalities such as Electrical Stimulation, Ultrasound, Ice, Moist Heat and Massage Therapy. When the patient’s pain and inflammation is reduced spinal adjustments are delivered. These adjustments are specifically targeted to the dysfunctional, misaligned vertebrae to restore motion and alignment in order to remove the mechanical stresses to the nervous system. As patients improve specific stretches and exercises are recommended to support the corrections and prevent future injury and degeneration. Patients are also instructed in proper ergonomics for their workplace and daily activities. At Progressive Chiropractic we are pleased to say that over 95% of our patients have been successfully treated for their neck pain safely and efficiently. Stop the pain NOW! Contact our office for your appointment.